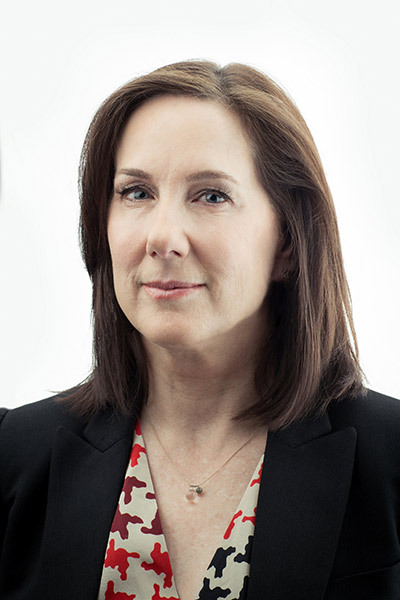 Nominated for eight Academy Awards®, Kathleen Kennedy is one of the most successful and respected producers and executives in the film industry today. She joined Lucasfilm in 2012, personally selected by George Lucas to lead the company. As a testament to her standing in the film community, she is currently Vice President of the Academy of Motion Pictures Arts and Sciences (AMPAS), as well as sitting on their Board of Governors. Kennedy has produced or executive produced over 60 films, which have collectively garnered 120 Academy Award nominations and 25 wins. Among her credits are four of the highest-grossing films in motion picture history: Jurassic Park, E.T. The Extra Terrestrial, Indiana Jones and the Kingdom of the Crystal Skull, and The Sixth Sense, as well as such blockbuster entertainment as the Back to the Future trilogy, Who Framed Roger Rabbit, Gremlins, The Goonies, Poltergeist, War of the Worlds, Twister and A.I. Artificial Intelligence. Her diverse filmography also includes acclaimed dramas like Lincoln, War Horse, The Curious Case of Benjamin Button, The Diving Bell and the Butterfly, Munich, Seabiscuit, Schindler's List and The Color Purple, and animated motion pictures like The Adventures of Tintin, Persepolis, An American Tail and The Land Before Time. Kennedy has produced the films of such directors as Steven Spielberg, David Fincher, Martin Scorsese, Clint Eastwood, Robert Zemeckis, M. Night Shyamalan, Frank Oz, Peter Bogdanovich, and Richard Donner.